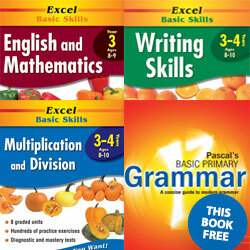 Pascal Press has everything you need to get your child ready for back to school. We’re here to help you make the transition back to school fun and stress free, giving your child the best start possible. Our recommended book list for 2019 has everything you need to get started! Being organised can be difficult, as any parent knows, from packing lunches in the morning with brain food for active little minds to ensuring everyone has their homework, supplies and textbooks packed and ready. We all want our child to succeed when it comes to their education, and enjoyment plays a huge part of keeping them motivated and happy. Pascal Press can help with this process, offering everything you need from textbooks to study guides that work in conjunction with the Australian school curriculum. We offer value for money with special offers and free resources to get you started. Looking for Back to School discounts on workbooks and textbooks? We also have many great sales during this crazy time! So you don't miss out, make sure you sign up to become a VIP Member today! Getting ready, scheduling and having a back to school checklist ensures you save time and stay focused. Our extensive 2019 Recommended Back to School Booklist can help you cross items off your checklist and ensures your child gets the best head start this year. Excel Early Skills - Add and Take Away to 20 Once your child has learned to count and recognise numbers to 20, and has learned to add and take away to 10, they can then learn to focus on adding and subtracting with totals of up to 20. BACK TO SCHOOL SPECIAL: $39.75 for the entire Kindergarten/Prep pack! BACK TO SCHOOL SPECIAL: $43.85 for the entire Year 1 pack! Excel Basic Skills-Basic Reading Skills Years 1-2 The aim of this book is to help primary-aged children with reading and comprehension using short pieces of writing. BACK TO SCHOOL SPECIAL: $43.85 for the entire Year 2 pack! BACK TO SCHOOL SPECIAL: $42.85 for the entire Year 3 pack! 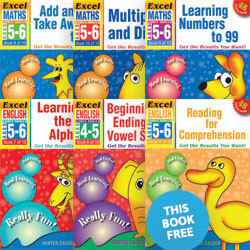 Excel Basic Skills English and Mathematics Year 4 This book supports schoolwork by having students practise key basic skills on a regular basis. This allows your child to learn new concepts while revising program work. Excel Basic Skills - Addition and Subtraction Years 3-4 Designed to help make students feel confident in the basic processes of addition and subtractions of whole numbers. BACK TO SCHOOL SPECIAL: $42.85 for the entire Year 4 pack! 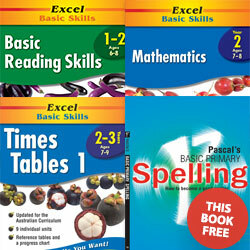 Excel Basic Skills - English and Mathematics Year 5 This book aims to build basic skills in reading, comprehension and maths. Excel Basic Skills - Multiplication and Division Year 5 Designed to make students feel confident in the basic processes of multiplication and division of whole numbers. 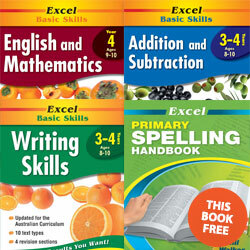 Excel Basic Skills - Spelling and Vocabulary Years 5-6 Essential for students who wish to improve their language skills. Excel Writer's Handbook Years 5-8 Helps your child develop essential writing skills through explanations, examples and structured activities. BACK TO SCHOOL SPECIAL: $42.85 for the entire Year 5 pack! BACK TO SCHOOL SPECIAL: $42.85 for the entire Year 6 pack! 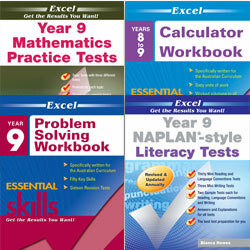 Excel Revise in a Month Year 7 NAPLAN*-style Tests Helps students prepare for the Year 7 NAPLAN Numeracy Tests. Excel Essential Skills Essay Writing Step-by-Step Years 7-10 Learn essay-writing skills for junior high school using this easy, five-step process. 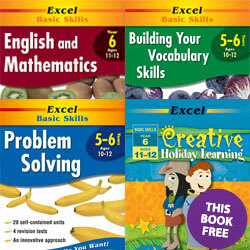 Excel Essential Skills Problem Solving Workbook Children learn the skills required to excel in both the problem solving and reasoning proficiency. Excel SmartStudy English Consolidates students’ understanding of Year 8 English in accordance with the Australian Curriculum outcomes. Excel Essential Skills Grammar and Punctuation Workbook improves students’ writing by teaching essential grammar and punctuation rules. 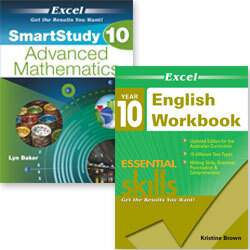 Excel Essential Skills Mathematics Revision and Exam Workbook Year 8 This book has been specifically written to help students revise their work and succeed in all their class tests, half-yearly and yearly exams. 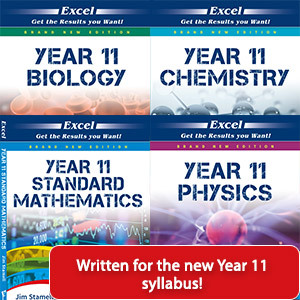 Excel Year 9 Mathematics Practice Tests Provides students with extensive test and exam practice at all levels in Year 9, in the topics they cover in class. Excel Essential Skills Calculator Workbook Years 8-9 It features questions that will test students’ numerical, algebraic, spatial, graphical and statistical concepts and skills. 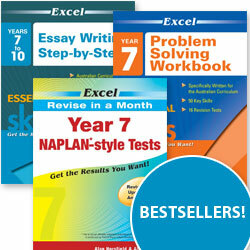 Excel Year 9 NAPLAN*-style Literacy Tests Revise for the Year 9 NAPLAN Tests! 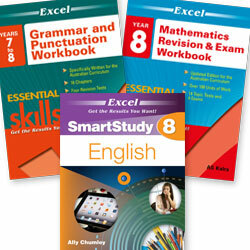 Excel SmartStudy Advanced Mathematics Year 10 This book outlines the six steps to test and exam success! Excel Essential Skills English Workbook Gives students practical help with writing tasks in Year 10 and later years at school. 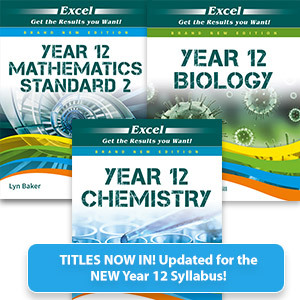 Excel Preliminary Study Guides BRAND NEW titles, updated for the new Year 11 Syllabus! This range is designed to develop essential skills in a variety of Preliminary subjects. 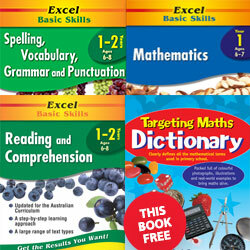 Excel Study Guides Designed to help students achieve the best possible HSC results. 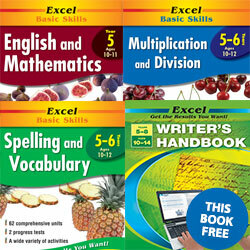 Excel Success One Series Titles within this series combine actual past HSC papers with clear and concise worked answers. Offer ends 1 May 2019.